UNCASVILLE, CONN. – May 17, 2018 – Dodge is bringing a once-in-a-lifetime opportunity to the 2018 Barrett-Jackson Northeast Auction with a charity sale of the last 2018 Dodge Challenger SRT Demon and 2017 Dodge Viper. The vehicles will be auctioned together on Super Saturday, June 23, at Barrett-Jackson’s 3rd Annual Auction at Mohegan Sun in Connecticut and 100 percent of the hammer price will benefit the United Way on behalf of the Dodge brand. In addition, a 10 percent buyer’s premium will be added to support Barrett-Jackson’s yearlong Driven Hearts campaign and benefit the American Heart Association. 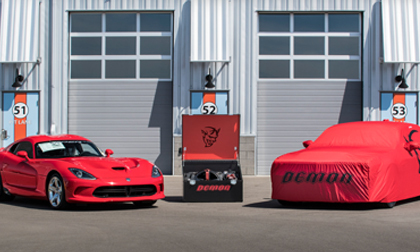 Dodge announced its initial plans to auction the end-of-an-era Challenger SRT Demon and Viper vehicles – “The Ultimate Last Chance” – in April during Barrett-Jackson’s Palm Beach Auction in Florida. The 2018 Dodge Challenger SRT Demon rattled the windows with its debut at the 2017 New York International Auto Show, grabbing attention with its 840-horsepower rating, street-legal drag radial tires and record-setting performance – first front-wheel lift in a production car as certified by Guinness World Records and world’s fastest quarter-mile production car (9.65 seconds ET/140 mph), certified by the National Hot Rod Association. Production of the Challenger SRT Demon is limited to one model year and a total of 3,300 units (3,000 U.S./300 Canada). Production of the American hand-built V10-powered Dodge Viper concluded at the Conner Avenue Assembly Plant in Detroit in fall 2017. The last-production 2017 Dodge Viper is styled in homage to the first-generation Dodge Viper RT/10 with its Viper Red exterior and black interior. The car (VIN ending in 731948) includes exterior carbon-fiber accents, black Alcantara leather seats and an exclusive VIN instrument panel badge and authentication kit. Barrett-Jackson’s 2018 Northeast Auction is June 20-23, 2018, and will be the first event inside Mohegan Sun’s new 125,000-square-foot Expo Center. The preview docket is now available; for information on becoming a bidder, including the opportunity to bid on the Dodge “Ultimate Last Chance” charity sale, go to www.Barrett-Jackson.com/bid. To submit an application to consign at the 2018 Northeast Auction, click here. Also, follow Barrett-Jackson on Facebook, Instagram, LinkedIn and Twitter for the latest news and information heading into the 2018 Northeast Auction.